Sweden is widely considered to be the world’s greenest country, but its surprisingly lax forestry laws often leave decisions about logging to timber companies, and large swaths of biologically-rich boreal forest are being lost. Federal agencies and certifying bodies such as the Forest Stewardship Council have tried to improve the situation, but activists charge that they are unable to prevent forestry companies from cutting even the most valuable and the oldest forest tracts. I traveled there in 2011 to investigate their claims. These forest watchdogs have trained themselves to identify rare and endangered species of fungi and lichens, whose presence prevents cutting of those richest tracts, a successful but rugged tactic requiring long days of trekking, climbing, and lifting or turning of many logs. This post is insider content, which is available to paying subscribers. This content is for Monthly, Annual and Lifetime members only. 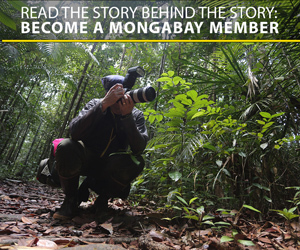 Membership offers a way for readers to directly support Mongabay’s non-profit conservation news reporting, while getting a first-hand, behind-the-scenes look at what it takes to produce these stories. Every few weeks, we’ll publish a new member article that tells the story behind the reporting: the trials and tribulations of field reporting, personal travel accounts, photo essays, and more. Access to our members-only newsletter. Access to periodic conversations with Mongabay journalists.